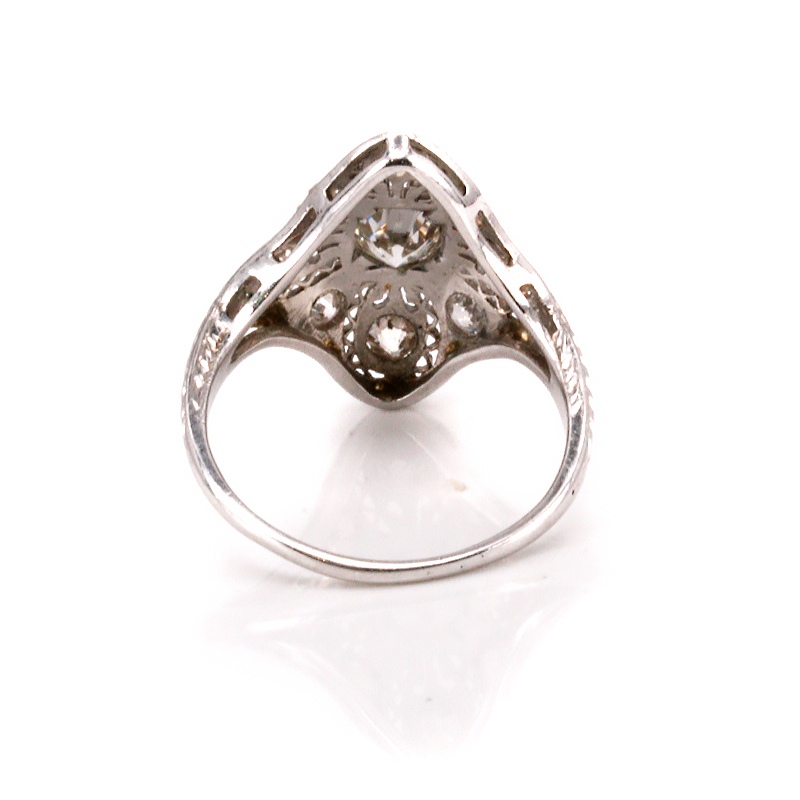 Product code: ES6200 Categories: Art Deco, Art Deco Rings & Art Deco Engagement Rings. 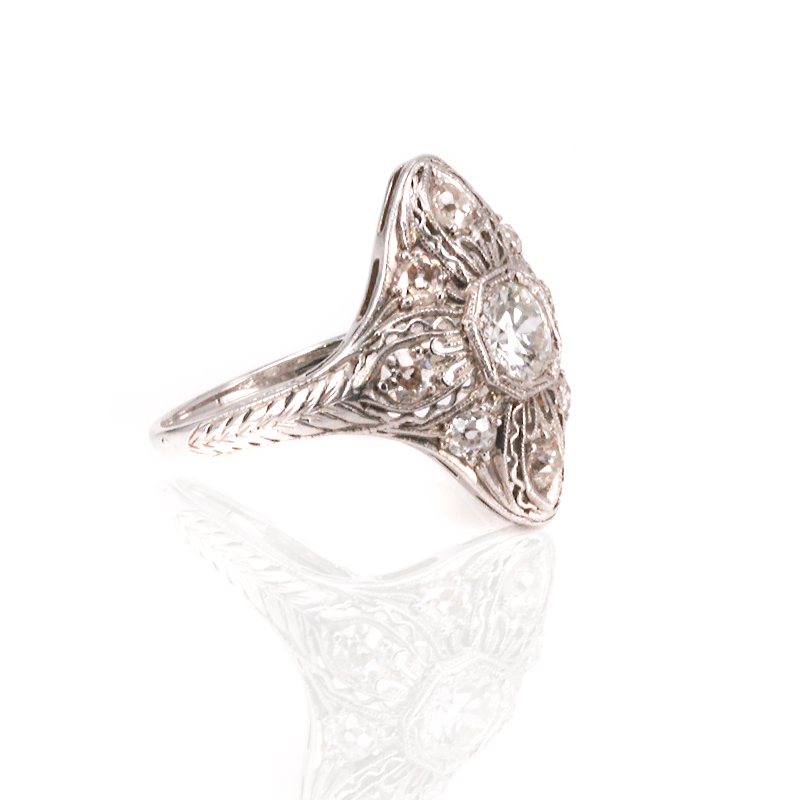 There is no denying that rings from the 1920’s look sensational and here is a very beautiful platinum diamond ring from the Art Deco era, that would suit any finger and occasion, including making an incredible Art Deco engagement ring. Expertly hand made entirely in platinum, the detail is just incredible and also highlights the advantage of platinum being able to be pulled so fine to achieve this quality of work, yet at the same time be strong enough to hold and support the diamonds. And also typical of Art Deco jewellery and designs, there is often a “shape in a shape” which can be seen with the round centre diamond being set into an octagonal setting. The setting then has the millgrain finish which again typical of jewellery from the 1920’s, can be seen as the elegant crimping along the edge of the setting. The diamond in the centre is a European cut diamond which measures 0.60 carats and has such a wonderful sparkle to it. And then set amognst that incredible work are eight more European cut diamonds that total 0.64 carats. 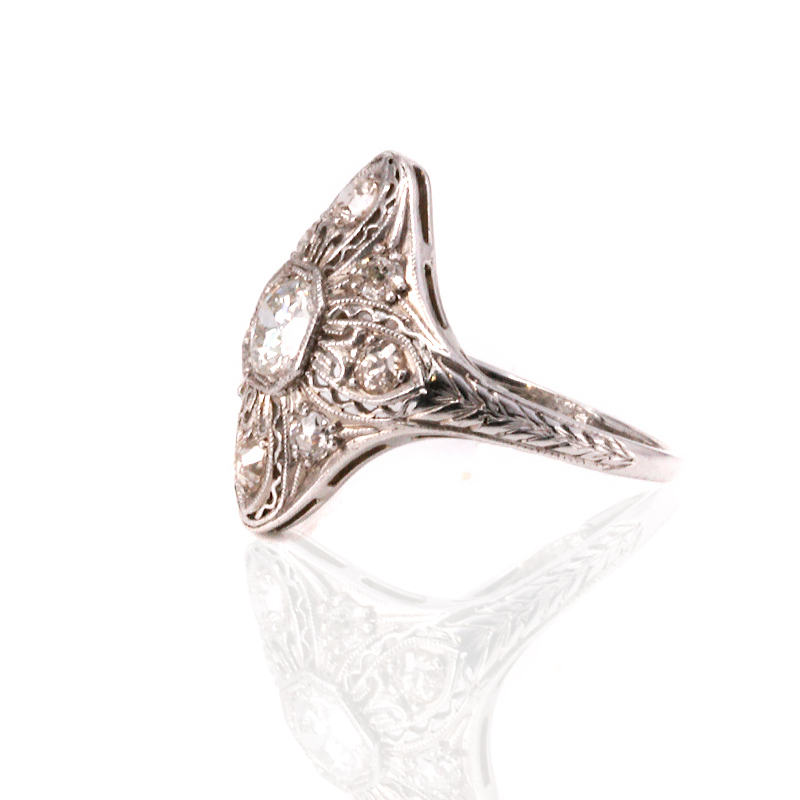 The sparkle that they give is just wonderful and really highlights the intricate design and detail that went into hand making this ring all those years ago. Measuring 19mm by 15.5mm across, it leads to the band which has been elegantly hand engraved to continue the craftsmanship and detail of the ring. From all angles, this is such a spectacular example of an Art Deco diamond ring that will always impress and and be admired.